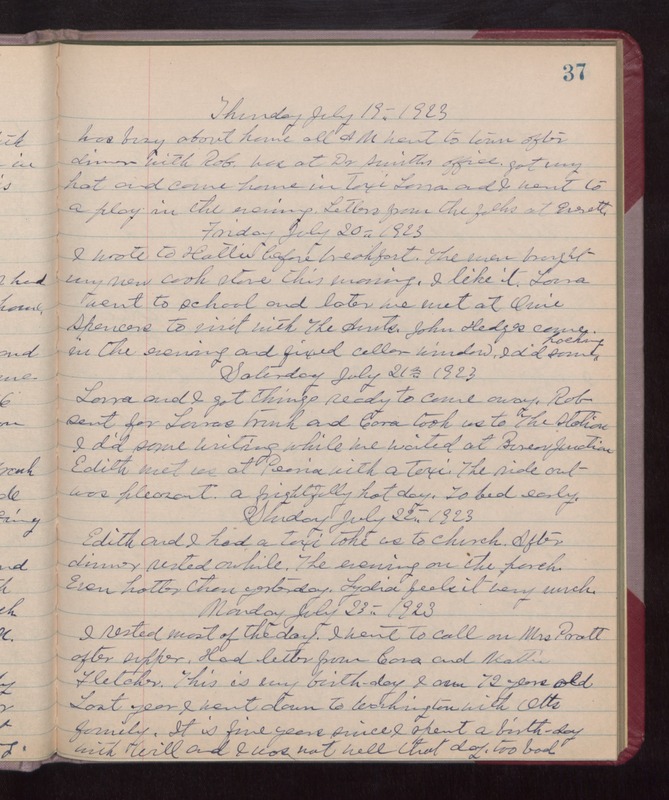 Thursday July 19th 1923 Was busy about home all AM. Went to town after dinner with Rob. Was at Dr Smiths office. Got my hat and came home in taxi. Laura and I went to a play in the evening. Letters from the folks at Everett. Friday July 20th 1923 I wrote to Hattie before breakfast. The men brought my new cook stove this morning. I life it. Laura went to school and later we met at Orie Spencers to visit with The Aunts. John Hedges came in the evening and fixed cellar window. I did some packing. Saturday July 21st 1923 Laura and I got things ready to come away. Rob sent for Lauras trunk and Cora took us to the Station. I did some writing while we waited at Bureau Junction. Edith met us at Peoria with a taxi. The ride out was pleasant. a frightfully hot day. To bed early. Sunday July 22nd 1923 Edith and I had a taxi take us to church. After dinner rested awhile. The evening on the porch. Even hotter than yesterday. Lydia feels it very much. Monday July 23rd 1923 I rested most of the day. I went to call on Mrs Pratt after supper. Had letter from Cora and Mattie Fletcher. This is my birthday. I am 72 years old. Last year I went down to Washington with Otts family. It is five years since I spent a birthday with Will and I was not well that day. too bad.